A few days ago I noticed a fresh pile of dirt near one of my tomato plants. Looking closer I noticed a hole in the ground next to the pile. I recognized the excavation as that of a cicada killer wasp. That’s a descriptive, but unimaginative, name for them since they really do kill cicadas. These wasps show up each year shortly after the cicadas arrive during the dog days of summer. These are big wasps that make a lot of scary buzzing sounds when they fly. Entomologists tell us that they rarely sting even when provoked. Mine were certainly even tempered. But I’m not the one that is going to tell you that they won’t sting you. I seem to remember a few years back some experts telling us that stingrays in the ocean are harmless, but I digress. I wanted to get a photo of the cicada killer when I first spotted it but it wouldn’t sit still long enough. As soon a I was able to get close enough to focus my phone camera, it would take off with the immobile cicada in tow. A few days later I forgot all about the wasp and was placing some straw around some of the tomato plants to keep the fruit off of the ground. Low and behold, there was a cicada killer, with a cicada, looking for a way to get into her tunnel. A shallow layer of straw slowed her down long enough for me to snap a couple of photos. The straw slowed down the wasp enough for me to snap a photo of the wasp and her prey. She found her way into the tunnel entrance. The female wasps are responsible for all the digging we see. They construct tunnels that are between six and 12 inches deep and can be three or four feet long, or even longer. That’s a lot of dirt for one insect to move all by herself. Often there are side rooms in these tunnels. Not only does the female wasp dig the tunnels, she also does all the hunting for the cicadas. The male is unable to hunt even if he wanted to since he does’t have a stinger. He does help however by scaring away predators. Once the female finds a likely victim, she plunges her stinger into the cicada, not to kill it mind you, but just to paralyze it. She wants the cicada to be alive when her offspring eats it. Once the cicada is immobilized, the wasp flips it over so it is face to face with its prey. 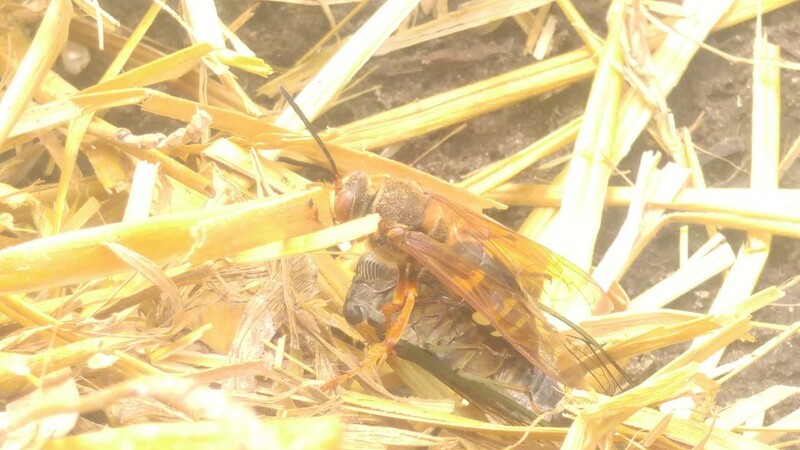 Even though the cicada can weight more than twice as much as the wasp, she is such a strong flier that she can lift it and fly with it to her tunnel. There she carries it down to one of the rooms and places it there as sustenance for her young. She then uses her stinger, which is actually an ovipositor , to lay an egg in just the right spot of the cicada. 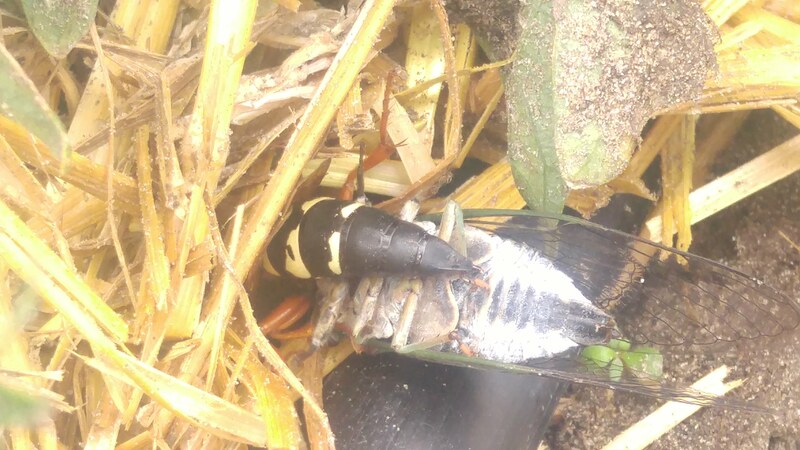 The wasp grub hatches from the egg right away and quickly starts eating the cicada in such a way to keep it alive as long as possible. In a few days, there is nothing left but the hollowed out shell of the cicada. In the meantime, the grub has grown into a full size larva. If the grub is a female, she gets to eat a second cicada. Once mature, the larva spin a cocoon and pupate underground until next summer when they emerge as an adult wasp. Like many insects, the adult wasp has a different diet than its larval stage eating only tree sap and nectar from flowers. They don’t even take a nibble from the cicadas they kill. Cicada killers prefer sandy soil with sparse vegetation — that pretty much describes my weed-free tomato patch. Also there needs to be trees nearby with cicadas in them to provide hunting grounds. 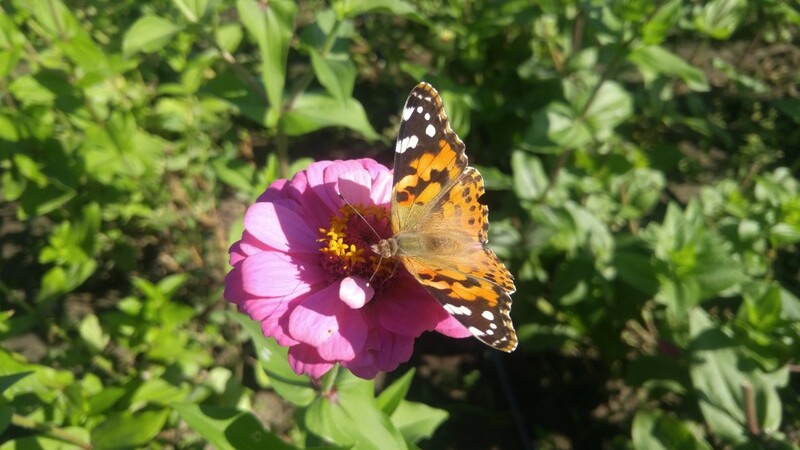 Now that we are at the end of the summer gardening season, at lot of us will begin pulling out old and worn out plants and tossing them in the compost pile. Notice the knobby, bumpy nodules. This is not normal for a sweet potato root. The abnormal growth is caused by a nearly microscopic worm-like creature called a nematode. Nematodes are the bane of sweet potato farmers in the southern states where sweet potatoes or other vegetables are grown year after year in the same spot. In addition to gnarled roots, nematodes also cause reduced yields. Often the damage shows up as black spots under the skin of the tuber that are not seen until the root is peeled leaving an unusable potato. This nematode damage can occur on almost any common vegetable plant. If you find a root that resembles the one in the photo, destroy it and don’t attempt to compost it, otherwise you risk spreading the pests to other parts of your garden. There is no method of control for nematodes in the garden except rotating your crops. You must rotate to a grass-related crop such as sweet corn in order to break the life cycle of the nematodes. “Regular” garden crops will support nematodes in the soil. 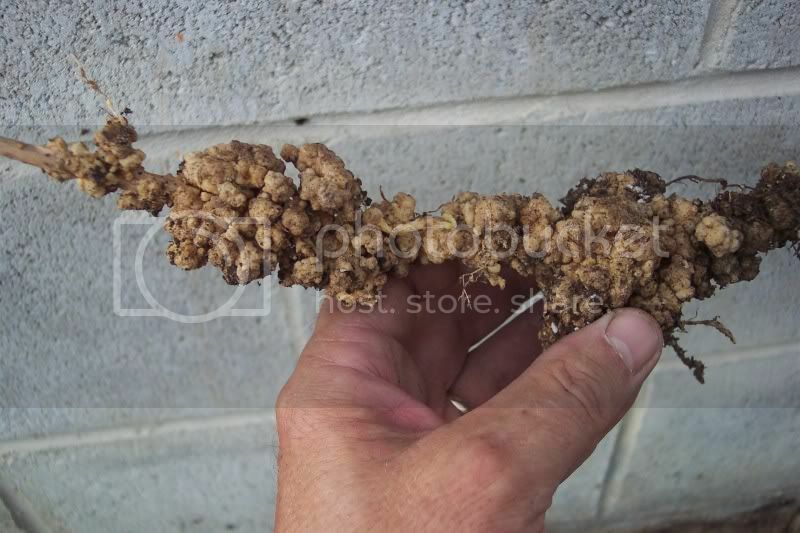 Knobby roots on legume plants such as peas and beans are normal and not caused by nematodes, so don’t dispose of them. Beans and peas have nodules on their roots that harbor beneficial bacteria. In this case the bacteria are beneficial to the plant and actually produce fertilizer in the form of nitrogen that the beans use to grow. Chances are you won’t see these symptoms in a new garden because the nematodes have not had enough time to multiply.